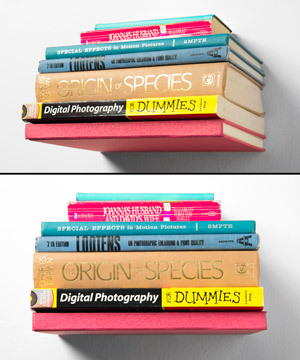 Conceal Invisible Bookshelf: Make books appear to magically float. Given a choice between a bulky bookcase and a floating stack of novels, picking the levitating library is a no-brainer. 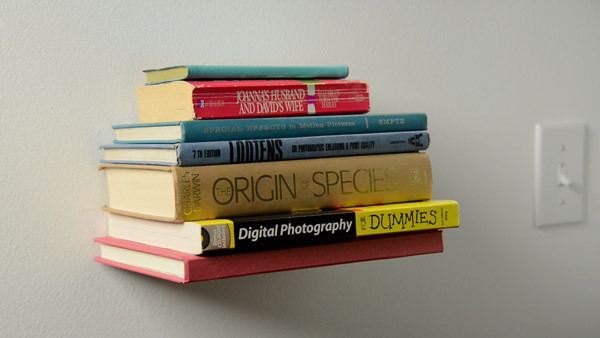 Conceal Invisible Book Shelves cleverly disguise the hanger, making your books seem to float on your wall. 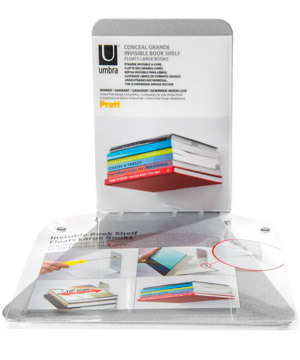 The ingenious design allows you to pile on 20 pounds of paperbacks, all without giving away the hidden support hanger. Your books simply appear to float! 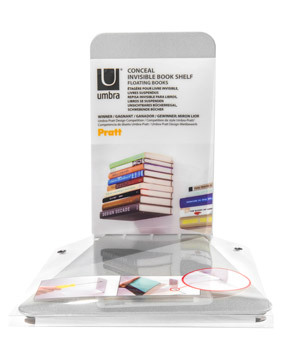 For full effect, the Conceal Invisible Bookshelf requires at least one hardcover book on the bottom. Anything you add after that, from paperbacks to knickknacks, is up to you. Installing a Conceal Invisible Bookshelf is a cinch. First, attach the back of the hanging shelf to your wall using the included hardware (preferably on a stud). Then slip the back cover of a hardbound tome between the secret bottom lip and the horizontal ledge. The book covers up the ledge while the concealed lip prevents the bottom cover from opening. Shut the book, stack on a few best sellers, and—like magic—the shelf disappears! 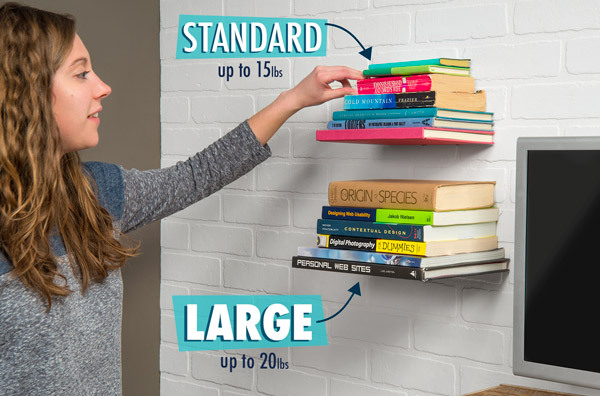 Because every book (and every collection) is a different size, Conceal Invisible Bookshelf is available in two different sizes. We spell out the details because it can be hard to see the difference between two invisible shelves. Question: How many holes will this leave on my wall? Answer: Installing either size of Conceal Invisible Bookshelves requires two small screws. Question: What tools do I need to install the shelf? Answer: Since each Conceal Invisible Bookshelf comes with screws, you only need a screwdriver to install them. Question: Why doesn’t the bottom cover of the bottom book flap open? Answer: There is a small lip under the horizontal ledge that catches the outside edge of the book cover. This is why hardbound books are recommended to use as the first book. Question: Can I use it to stack video games? Answer: You could put video games on it, but the horizontal ledge will not be hidden unless you start with a hardcover book.